I am hearing impaired and began wearing hearing aids in 2012. I was pretty much forced to by my job and my wife. As for the job, I decided it was a bad idea to continue to complete meetings with clients and then have to ask my account executive what we just agreed to do. Janis was another matter. I had to turn the TV up so loud it bothered her. Wearing TV headphones helped that. I could crank the volume up in the headphones, and she could listen through the speakers at normal levels. And by-the-way, she has the hearing of an Arctic Fox hunting for moles under three feet of snow. That worked until I bought a new TV and later, Apple TV. Apple TV doesn’t go through the Dish Satellite DVR, which is what the headphones are plugged into. No problemo! I bought an audio system with six speakers, thinking I could plug my headphones into the TV, which silences the sound coming out of it, and Janis would listen through the nice six-speaker audio system, while I listen through the headphones. One minor problem: The TV doesn’t have a headphone jack! That means whenever we are watching something on Netflix through Apple TV, I have to crank the volume way up (nice bass!) and past Janis’ comfort level. Now I have to buy a new TV with a headphone jack. “How did this hearing problem happen?” you ask. 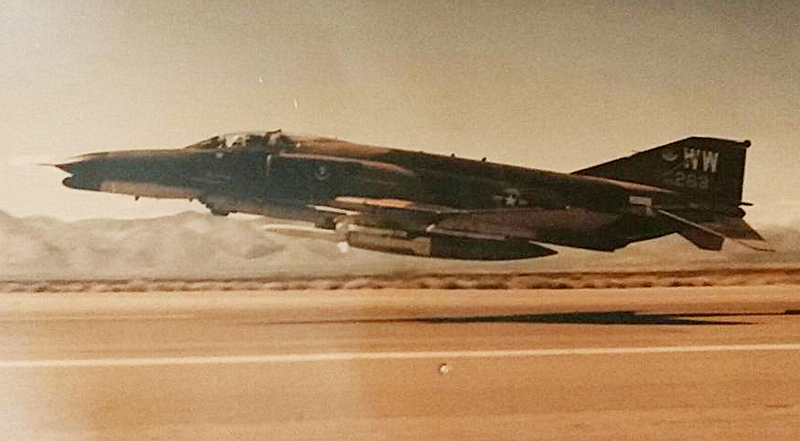 Listening to loud rock music through headphones, gunfire without hearing protection, and listening to F-4 Phantom IIs take off on a daily basis while in the Air Force. The weather observation site where I worked was about fifty yards from and about halfway down the active runway. And that would be about where they “rotated,” meaning just as the front landing gear came off the ground and both engines were under full, screaming, flame-spitting, afterburner power. Yes, it was loud. Very loud! We were issued hearing protection, but I know of no observer who ever used them. I was thinking, So what! I can hear fine. Just give me my discharge. Well, I couldn’t hear fine, and it progressively got worse. I began to realize something was wrong when I was in bed at night and I could hear crickets chirping—in January! That is when I discovered those “chirping crickets” were tinnitus—hearing loss that is not recoverable. Some funny stories, of course. Being hard of hearing has led to some humorous situations, usually the result of me attempting to “fill in the blanks” of what I just heard someone say. My brain hears a few words of a six-word sentence and “logically” supplies what the other words must be. Trouble is, my brain usually gets it wrong. One such incident occurred in Baton Rouge while we were displaced because of Katrina. We were having dinner one night with my sister-in-law, Beth, and her husband, Sid. Beth had invited some of her realtor friends to join us. None of them had arrived when Beth and I got into an argument over something she said and I didn’t understand. Actually, it may have been several things I didn’t understand, and she got flustered over me guessing wrong or asking her to repeat what she said. About then one of her friends arrived, and Beth did the introductions. When she got to me, still a bit flustered, she said, “This is my brother-in-law, Lane, and he is hard of hearing” But she said the “hard of hearing” part loud for emphasis. We all laughed—except the very confused Mary. She burst out laughing, and not a giggle laugh but with gut-deep guffaws. I was then really confused. Not only didn’t I understand why she found my question so funny, but I was wondering why she thought his sexual preferences had anything to do with the work. Comments Off on Hearing Impaired.